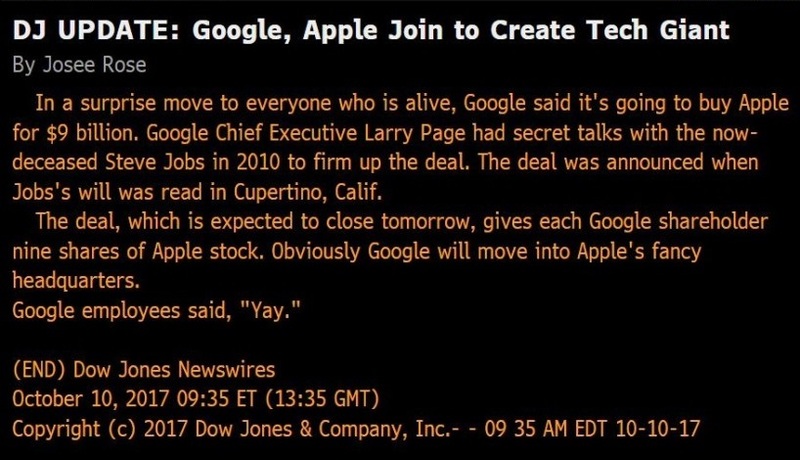 Home » Investing » Trading Strategies » Google’s Buying Apple? We know this is ridiculous. And we wouldn’t place a trade on something like this. Maybe we Google the topic to check its credibility. But when you read the story, it’s even more ridiculous than the $9 billion price tag listed here. Apple Inc. (Nasdaq: AAPL) is currently worth $809 billion. And the deal was in Steve Jobs’ will when he passed away six years ago? Dow Jones has these fake stories that it uses for testing and such, and somehow, due to a technical error, one was leaked into the real, live newswire. I’m sure people didn’t take the bait to trade on this. And even if they did, the $9 billion price tag would have caused Apple’s stock to crumble, not go up. But something did trade on the news — the computer-based trading systems. Hedge funds now have algorithms built around news releases just like this to instantly buy the stock being acquired. It happens in fractions of a second, and shares are scooped up right away. The long green bar on the left side of the chart is the minute after the press release hit the wire. 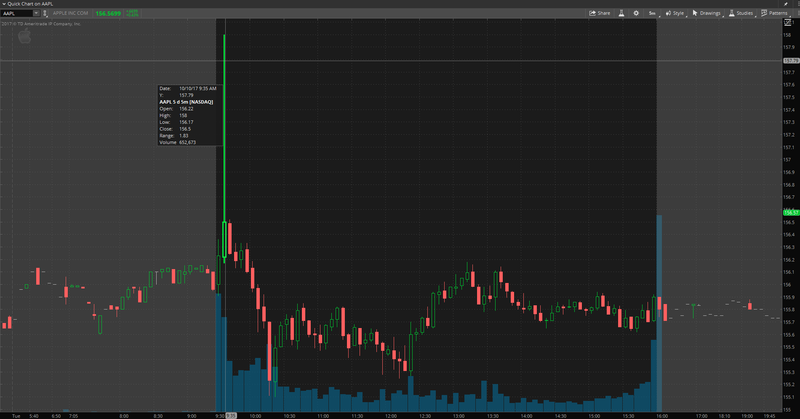 You can see volume went higher, and the price shot up to a high of $158, from about $156. The entire green bar represents the prices traded over that five-minute period, and clearly it is the longest bar on the screen. It didn’t take long for things to settle, as people realized this was a mistake, but it does go to show how easily these computer-based trading programs can be manipulated without human intervention.